Go Jo Schmo! Second and third graders will root for this intrepid fourth grader who fights crime in her bathroom breaks. Who wouldn’t to take time off from class to perform super heroic deeds? The first book in the series explains how Jo got her superpowers. However, each book is a stand alone story — all that the reader needs is to believe that Jo and her trusty sidekick, Raymond, have superpowers, and use it to fight crime. 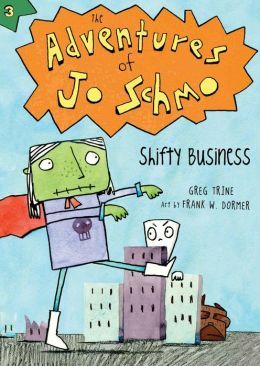 The Adventures of Jo Schmo: Shifty Business is about shifty business indeed. The ‘shifty business’ refers mainly to Jo Schmo’s shape shifting. Grandpa Joe asks her what superpower she would acquire next. Jo ponders a bit, then says that shape shifting would be useful to a superhero. But Numb Skull and his pals are also up to ‘shifty’ (evasive or deceitful) business. This could be an interesting reading activity in classrooms. Teachers could help students make lists of all the puns in the story. A great part of the fun of the books is the clever word play the author indulges in. We have all heard of crime waves. In Jo Schmo’s world there is the crime ripple, which is what you get before you get a crime wave. Ripple, wave, tsunami — that’s the way it works in the crime world. Even a second grader could see that that is a perfectly logical progression of crime! Shape-shifting Jo goes head-to-head with shifty Numb Skull in a race to save her town from the biggest crime-tsunami ever. Sharks and whales and a drooling dog with a swishing tale spice up the story. Who wins? Read to the end to find out.